Once upon a time there must have been people who would have made the first fire, the first wheel and the first house. Hundreds of years later someone touched the surface of the moon for the first time, someone was the first to scale Everest and someone was the first to gauge the depths of the oceans. This year is special too as something big is going to happen for the first time. Shall we take a quick peek into the recent past? Let's! Was Khoj, with equity research as its major draw. An eclectic, exciting mix of events, in it we saw. BhavITva promises to use IT to allay industry fears. Blossomed BuZZ-aaR, truly the marketing event of the year. Than each of the four jewels mentioned above. This is with what we are all going to fall in love. To foster which we took the onus. The New Sensation – OJAS! SPJIMR is delighted, and proud, to introduce OJAS '09 – The Sparkling Annual Festival of the College – which integrates the four worlds of ceaseless motion – Finance, Marketing, Operations and Information Management – into a unified whole. The very word 'OJAS' traces its origin to the Vedas – It is a mixture of eclectic elements which gives birth to a perennial fount of vitality, vibrancy and endurance. OJAS is a celebration of the very power which resides in each one of us and manifests itself in forms like diligence, creativity, intellect et al. While you all have already witnessed the launch of the four central attractions – Khoj, BhavITva, Shrinkhla and Buzz-aaR – we thought we'd keep the last one a surprise! So here it is now! 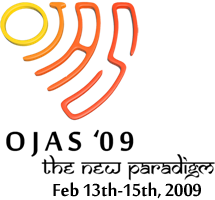 Please welcome Melange – a potpourri of events guaranteed to enthral the participants and challenge them to explore their intellectual and creative potential. This is going to be a magical potion of events which you would never have dreamt of! But we can guarantee one thing – there won't be a single dull moment around when Melange takes the centre stage! 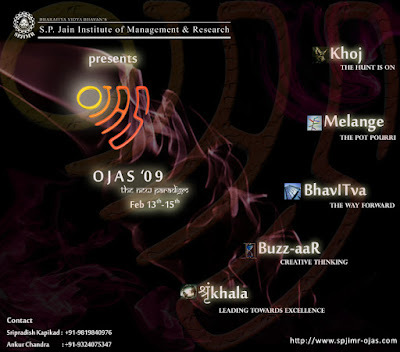 We, at SPJIMR, warmly welcome you all aboard the maiden voyage of OJAS! It promises to be a journey which would require the use of the twin forces of competition and collaboration to foster mutual growth. Come, live with us for three unforgettable, high-octane days and soak in the electricity which the very air around will be charged with.